The uncertainty of having a place you can call home, and knowing that there would be times you may not have a roof over your head is already tough enough. But for a 17-year-old who has to deal with schoolwork while also being there for his younger brothers, life was an ongoing struggle. Rushing through breakfast in the morning before school, attending lectures, doing your homework and working on assignments - these may have been things we took for granted when younger, but for 17-year-old Dylan, these were luxuries he yearned for. And now, after battling homelessness with his two younger siblings and single mother, the teenager has been accepted into, not one or two, but 17 colleges! Dylan Chidick, a senior at Henry Snyder High School in Jersey City, is all set to be the first in his family to attend college. The uncertainty of having a place you can call home, and knowing that there would be times you may not have a roof over your head is already tough enough. But for a teenager who has to deal with schoolwork while also being there for his younger brothers, life was an ongoing struggle. Khadine Philip came to the US from Trinidad in search of a better future for her three children. Dylan was just 7 years old at the time. Things were especially difficult after they gained US citizenship. Dylan's younger twin brothers suffer from heart ailments. The family battled homelessness for years, CNN reports, but the single mother worked hard to ensure she did the best she could for her three boys. Dylan says, "There was [sic] lights out at a certain time, and we weren't able to be the way that we usually are at home." However, Khadine managed to secure help from Women Rising, an organization that helps struggling women provide for their families and help them build a stable future. The single mother and her three boys were given supportive housing by the non-profit organization, which meant Dylan wouldn't have to worry about shelter for his family while he focused on his education. And that is exactly what he did. At Henry Snyder High School in Jersey City, Dylan was surrounded by fellow teens planning their future without having to worry about a roof over their head. It wouldn't be surprising for the 17-year-old to hesitate before opening up about his situation. While the struggle to build a stable home continued, Dylan worked hard at school and managed to become the senior class president. He says, "The entire administration staff was very supportive, but I didn't want anyone to know about it at first." But his apprehension was met with warmth. "I realized it was OK to let people in." When the time came to send out college applications, Dylan wanted to take no chances. Applying in multiple colleges may be common, but for a young teen who wanted to study so he could earn well and provide for his family, multiple meant 18! Dylan sent out applications to 18 colleges and universities. And while applying for higher education is undoubtedly expensive, the teenager managed to obtain application waivers. And it was not long before the acceptance letters started coming in. 17 of the 18 colleges and universities he had applied in responded positively, all welcoming him with open arms. 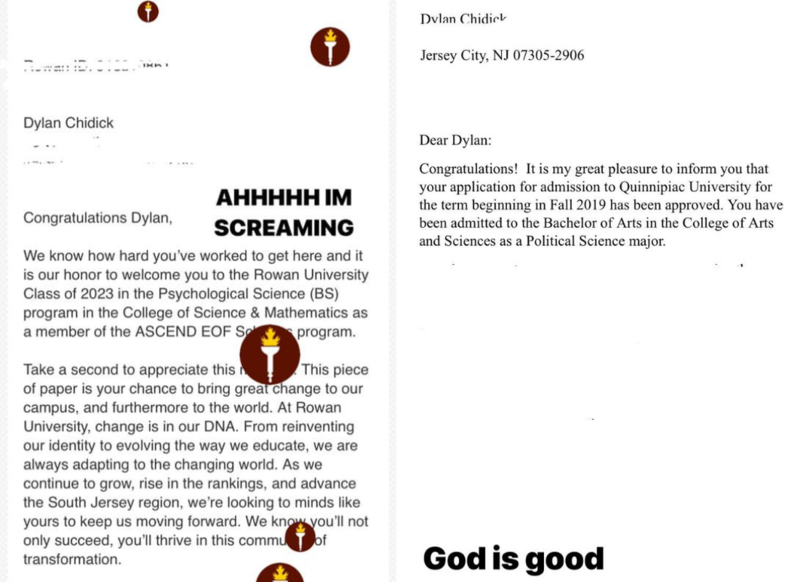 While the teen has a host of choices to pick from, including Swindon College, Rowan University, Albright College, Quinnipiac, and New Jersey City University, he is still waiting to hear from the College of New Jersey, the one he hopes to pursue his education at. Seeing the college acceptance letters should come as no surprise, considering the fact that Dylan managed to be on top of his game at school. Apart from serving as the class president for the last three years, the 17-year-old has been part of his school's National Honor Society as the vice president and is also a Jersey City Youth Ambassador. Not having to worry about being homeless had truly brought out the true potential in Dylan. At the same time, his mother's drive to do the best she could for her three sons also inspired Dylan. Watching his "very independent" family become vulnerable as they sought help from Women Rising is what pushed him to do better. Talking about how his small family doesn't like accepting help, Dylan says, “seeing them go through that experience made me change my ways and made me more determined to have my dreams and accept help from others to basically plan my future out correctly,” NBC reports. Now that Dylan, his mother, and twin brothers have been provided with a home, he can focus on his college education while his mother strives to take care of her younger sons and work towards a dream of her own. Khadine wants to open a Carribean restaurant and Dylan hopes to help her achieve that.